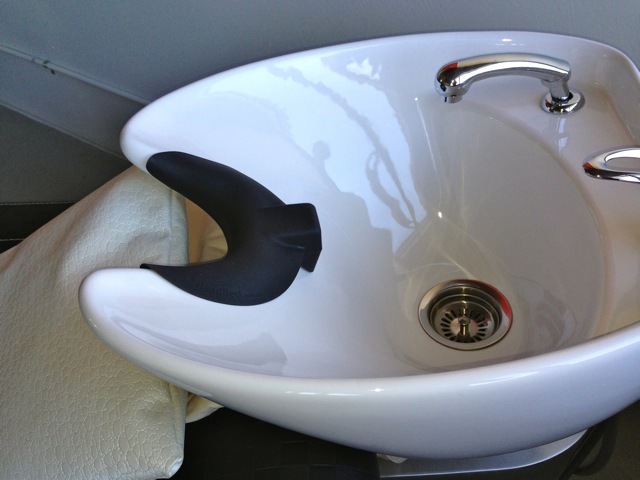 HeadBed is the all new, unique and truly innovative Head and Neck Support Cushion, finally solving the problem of client discomfort at the salon sink. HeadBed is a small platform that is built into a rubber cushion that sits on a salon sink. It assists in placing clients in the optimal position for all washbasin services as it is designed to support the head at its heaviest point. Our HeadBed supports the weight of the head, under the occipital bone, like a golf ball on a tee. As a result your clients can lay back, relax and enjoy pre-service shampoos, treatments and post-treatments without discomfort or pain. HeadBed is a patented head and neck support cushion. The specially designed sink cushion is small enough to support the head and neck but also not interfere with hairdressers completing their tasks at the washbasin. HeadBed will add another experience to the overall visit to the hairdressers with extra comfort, care and safety at the salon sink. It’s not just clients who have fallen in love with the new HeadBed but hairdressers alike. Hairdressers are beginning to report nearly zero customer complaints on the issue of discomfort at the salon sink. HeadBed also eliminates water leakage, keeping customers dry and comfortable and makes colour removal easier. “Whilst conducting extensive research over the years, the number one complaint I heard was ‘the discomfort and pain associated with leaning back in the salon sink’ so I solved it" says Catherine Randabel, Inventor of the HeadBed. advancements in customer comfort for decades. Paris Mondial Coiffure Beautee. On the 20 and 21st of September. Come and meet the HeadBed inventor Catherine, at Cindarella stand at the P.de Versailles expo halls on such a date... For demonstrations of the HeadBed on wash units. Have all you questions answered by Catherine and the staff of Cindarella. Really looking forward to meeting you there.